The lead finals was canceled because of the storm and raining, the ranking from semifinals decided: 1st Lama, 2nd Millet, 3rd Voerhoven, 4th Mrázek. Ženy: 1st Eiter, 2nd Levet, 3rd Sarkany. Women: 1. Danion, 2.Bibik, 3. Eiter. The World Cup competition in bouldering and speed climbing takes place this weekend in Veliko Tarnovo, Bulgaria. 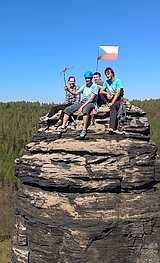 Czech Republic was represented there by speed climber Libor Hroza who ended 10th. There is an invitation for an open bouldering contest taking place in Romania, Bucharest on 15-16 April.